By visiting Doctors of BC (British Columbia Medical Association) online at www.doctorsofbc.ca, you are accepting the practices described in this privacy notice. This website has physical and technical measures in place to ensure the security of information. Servers reside in a locked room and are accessible only to a limited group of authorized personnel. We also use advanced encryption and firewall technology. The entire Physician Members and Physician Non-Members sections of this site are encrypted using industry standard 128 bit SSL. This is the same encryption used by banks for on line transactions. Encryption ensures that information in transit between your computer and the Doctors of BC server cannot be read or changed. Periodic penetration and social engineering tests are conducted. Security measures have been integrated into the design, implementation, and day-to-day operating practices of the website as part of our continuing commitment to privacy. Doctors of BC does not track patterns of usage by any visitor.Doctors of BC does collect information in log files on this server. This information, such as browser type, operating system, time of access, etc., gives us the opportunity to improve service and identify any problems. This information is not released to any third party. The only exception to this is if we are legally compelled to provide this information. There is an obligation for Doctors of BC to be able to track any unauthorized usage. Doctors of BC has links to other websites that are not under its control. Doctors of BC is not responsible for the contents of any linked website, any link contained in a linked website, or any changes or updates to such websites. The inclusion of any link does not mean that Doctors of BC endorses that website. Please be aware that Doctors of BC is not responsible for the privacy practices of other websites that we link to. We encourage you to read the privacy statements of every website that requests personal information from you. If you have any questions or comments about Doctors of BC's online privacy statement, e-mail our Privacy Officer or contact us at 604 736-5551. 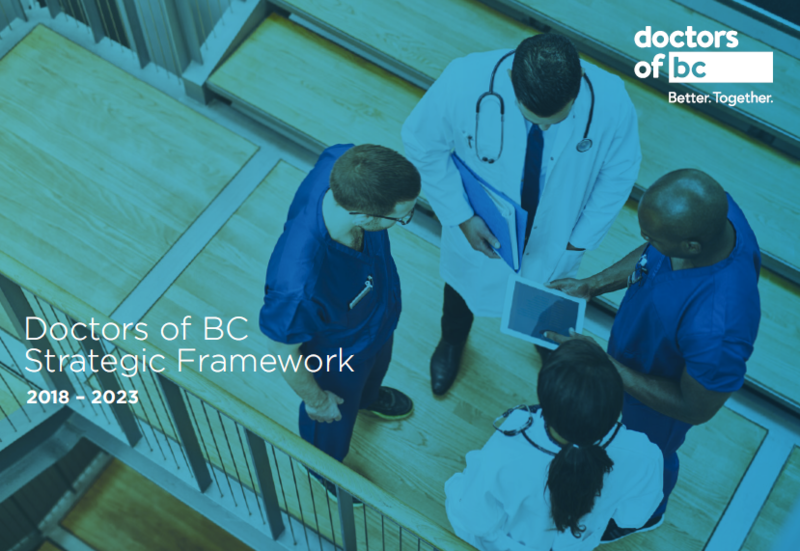 The Doctors of BC Privacy Code is a formal statement of principles concerning the requirements for the protection of personal information provided by Doctors of BC. The objective of the Privacy Code is to promote responsible and transparent practices in the management of personal information, in accordance with the provisions of the Personal Information Protection Act. These ten principles, which form the basis of the Doctors of BC Privacy Code, are interrelated, and Doctors of BC will adhere to the ten principles as a whole. Doctors of BC will continue to review its Privacy Code to ensure that it is relevant and remains current with changing technologies and laws. Doctors of BC is responsible for personal information under its control and will designate an individual or individuals who are accountable for the organization’s compliance with established privacy principles. The purposes for which personal information is collected will be identified by Doctors of BC before or at the time the information is collected. Doctors of BC will ensure that the knowledge and consent of the individual are required for the collection, use, or disclosure of personal information, except where inappropriate. The collection of personal information will be limited to that which is necessary for the purposes identified by Doctors of BC. Information will be collected by fair and lawful means. Doctors of BC will not use or disclose personal information for purposes other than those for which it was collected, except with the informed consent of the individual or as required by law. Personal information will be retained only as long as necessary for the fulfillment of those purposes. If you would like to opt out of any communications from Doctors of BC, please login to your account, click on the My Account button and update your Mail Preferences, Privacy Settings and Subscriptions. Doctors of BC is responsible for ensuring that personal information is as accurate, complete, and up to date as necessary for the purposes for which it is to be used. Doctors of BC ensures personal information is protected by security safeguards appropriate to the sensitivity of the information. Doctors of BC makes information available about its policies and practices relating to the management of personal information. Upon request, Doctors of BC informs an individual of the existence, use, and disclosure of his or her personal information and the individual has access to that information. An individual has the ability to challenge the accuracy and completeness of the information and have it amended as appropriate. An individual has the ability to challenge Doctors of BC’s compliance with these principles by contacting the designated individual or individuals accountable for the organization’s compliance. For more information please contact our Privacy Officer at privacyofficer@doctorsofbc.ca or call 604 736-5551.